Maxim Yefimov was an activist working in the field of human rights in Karelia, in the Russian Far North. Following criticism of the Russian Orthodox Church, authorities attempted to incarcerate him in a mental institution. He was kept sane by the conviction he was doing right, but eventually the threat led to flee the country. Here is his story. For almost three months now I have been living in Estonia, a small country that can be traversed from south to north in about two hours. Most people here speak Estonian, a language I don’t understand at all. It’s the only place in the planet where this language is spoken and they make full use of that. Otherwise everything here is the same as in Russia, though the roads are better, the air and the streets are cleaner. And no one would dream of putting a sane man into a mental hospital and prosecuting him for expressing his views. However, I am still in touch with my longsuffering homeland – how could I lose such an intimate link, when the criminal investigators there can’t live without me and are preparing to search for me not only in Russia, but throughout the world? They are demanding that I go to prison for my criticism of the Russian Orthodox Church. My own homeland is the republic of Karelia. Even Russians confuse it with Korea, so not much hope for foreigners, who know only one Karel, the Czech popular singer Karel Gott. Karelia is next to Finland and it is so big that it could easily accommodate several European states. Nature there is very beautiful, which is why it was so often painted by Russian painter and philosopher Nikolai Roerich; the government, however, is not – and is doing its best to destroy the flora and fauna. The population is shrinking because people don’t want to live in Karelia, where there is unemployment, the environment is polluted, there is poverty and frustration. I was born in the capital, Petrozavodsk, and grew up there. My favourite place in the world is the shore of Lake Onega, a breathtakingly beautiful place. I have a one-room flat is in a street named in honour of Gustav Rovio, the Finnish revolutionary who at one time sheltered Lenin. Petrozavodsk was founded more than 300 years ago (in 1703, the same year as St Petersburg), but it is a typical Soviet city with its huge blocks of apartments. Most people in the city work in the public sector: there used to be industry there, factories and plants, but now there are just a great many ministries and other departments. I was a student in the humanities at the university, graduating with a degree in Russian language. I became a teacher of the mighty Russian language and its literature from time immemorial to the present day, but didn’t devote myself to a life in school. The rampant injustice in Karelia led me to become a journalist and human rights campaigner. 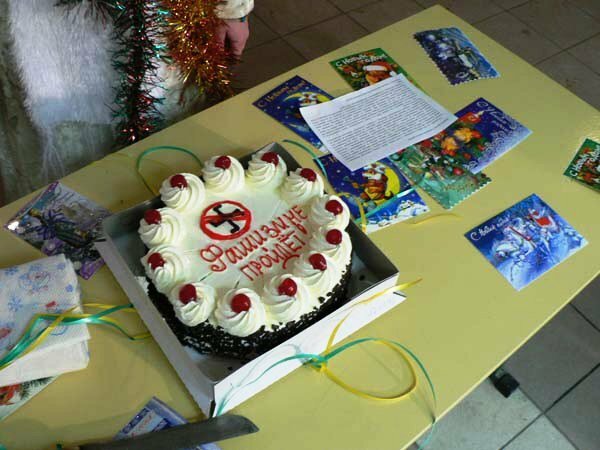 “Fascism will fail” reads the message on the cake. Maxim Yefimov was seriously concerned about the rise in nationalist and pro fascist radical tendencies in Russia. I began working in the field of human rights in 1998, when my right to refuse military service was trampled on by the Army Recruiting Bureau, who wanted to put me in prison for turning down this honourable obligation. I was only 15 when, like hundreds of thousands of other Russian boys, I received my call-up papers. I decided I would not serve in the army: I didn’t want to kill people and lose precious time from my life, doing 2 years of square-bashing and pointless labour. The officers at the Recruitment Bureau talked to me, they even offered me the possibility of studying in the school for lieutenants, but I turned down even that flattering proposal. At the time I was very taken up with the works of Herman Hesse, various ethical and religious ideas and the works of Lev Tolstoy, who was against war. So in spite of all the intimidation and threats to put me in prison, I stood my ground, rather like the Tin Soldier. Armed with the crass decision of the call-up committee and jolly memories of encounters with the general and his colonels, I went to court, where I spent a year arguing my right not to serve in the Russian army. In 1999 I became the first person in Karelia to succeed in defending this right in court, although few people actually believed I’d done it, including many Karelian human rights campaigners. My work in this field started with this obvious and improbable event. I started helping young men in the same position as myself. In 2000 I set up the Youth Human Rights group and became its head. We offered everyone free legal advice and help. In the 2000s, Karelia, as indeed the whole of the rest of Russia, witnessed the rise of nationalist tendencies. Organisations like Russian National Unity and other boneheads became very popular, enjoying the covert support of the Church as well. We considered them a threat to human rights: astoundingly, antifascists are to this day prosecuted for incitement to hatred of a social group, the ‘nationalists’. I began publishing an anti-fascist and human rights newspaper called ‘Zero Hour’. In the first issue, I published a small excerpt from Arthur Kronfeld’s pamphlet; I called it ‘Imbeciles in power.’ The director of the printing house saw the title and advised me to go carefully in criticising the Karelian authorities, but the article was about the politicians of the Third Reich. We wrote about the history of the Holocaust and Soviet political repressions, which had been carried out on a huge scale in Karelia. We used this historical material to promote the values of human rights and democracy. I was warned, told I was playing with fire, and that it was very dangerous. But I was sure what I was doing was both right and essential for Russian society. Our publications (newspapers, magazines, pamphlets, books, CDs) targeted the racism, xenophobia, intolerance, authoritarianism of today and promoted democracy, human rights, personal freedom, and tolerance. Overall, our circulation was approximately 20 20 20 000, not including individual publications in the media and on our internet websites. For a small organisation it was pretty impressive. It goes without saying that the work required total dedication, but everything succeeded because I was surrounded by people who thought as I did. The Youth Human Rights group engaged in many forms of activity. We organised pickets against abuse and forcible call-up to the army, during one of which I was detained by the police and fined by the magistrate for using a defective megaphone. I sat in the police station, which smelt horrible, for three hours. Taking part in this protest were activists from our group, my friends, and also complete strangers. We were calling for the Minister of Defence to give the soldier Andrey Sychov his legs back [which had to be amputated following grotesque abuse during his military service, ed]; actually we were demanding Ivanov’s resignation (some time later he was indeed removed from his post). When I went into the street with a megaphone, I wanted to reach people and to appeal to them. It is, after all, our silent consent that allows the continued perpetration of so many crimes and murders of young people in the army. My group organised the Human Rights March, an unheard of event for our region. All Karelia knew were military parades and the obligatory communist demonstrations with slogans such as ‘People and Party are One’ (in the same way as wolves and sheep, as the underground joke went at the time) and ‘Lenin Lives.’ Nothing that would count as free expression of opinions ever happened. During our march people were calling for transparency in government, freedom of speech and convictions for crimes committed during the Chechen war etc. Much of what we did was a first for Karelia. 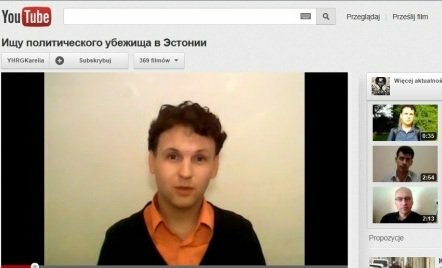 In 2008, for instance, we published an information pamphlet against homophobia; we wrote articles and made video clips about the phenomenon of homosexuality. I saw that the LGBT communities in big cities were fighting for their rights, against defamation and decided to support Karelian gays and lesbians, who were intimidated and very wary. These quite ordinary people were the victims of squalid political spin and my whole being protested against this. I was becoming louder with my verbal attacks because no one would listen, while the outrageous and systematic crimes committed by the authorities remained unpunished. We made video clips, which brought the issues to the attention of ordinary Karelians, and subsequently the whole country. We were the only people courageous enough to highlight the forcible takeover of the plant in Kondopoga and how its woman owner was not only robbed, when they took away her factory, but viciously beaten up on two occasions. The thugs knew they would get away with it because they had connections in the higher echelons of power in Karelia. 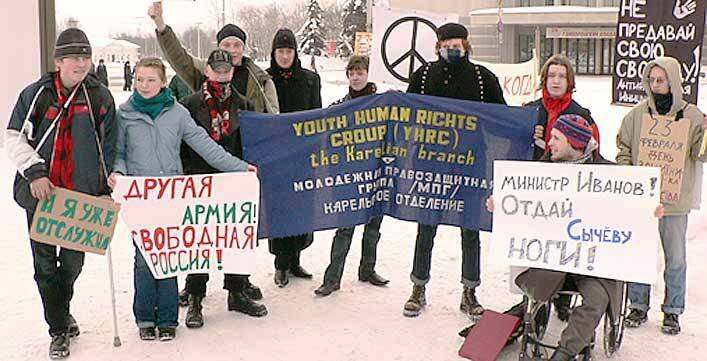 Yefimov's Youth Human Rights Group in Karelia protest against hazing in the Russian army. Far away from federal media and foreign diplomats, regional activism requires a great deal of courage. Another case, which we alone published, was the murder by bailiffs of a sick man. Despite his mothers’ protests and her warnings that he was very ill and in need of regular medication, he was taken to court without the medication. He had an epileptic fit, fell on the stone floor and died. Not one of the bailiffs was prosecuted; the prosecutor’s office stated that there had been no crime, as the bailiffs had been carrying out a legal court decision. The Youth Human Rights group and I personally were the thorn in the sides of the Karelian government. But they got their own back. I was dropped from the post-graduate programme I was on. Then, on 5 April 2012, a case was brought against me for an article called ‘Karelia is sick of priests’, which highlighted the omnipotence of the secret services, the rampant corruption, the oligarchy and the fusion of church and state. The investigating officers considered that this piece was designed to offend a social group, Orthodox people, who they say were described as ‘bearded mummers,’ ‘secretaries for ideology’ and ‘brats.’ But the piece was about priests! Naturally, I did not call for any violence or infringement of citizens’ rights. The authorities obtained a warrant for a night-time search of my flat. When the officials from the Ministry of Emergencies started breaking down the iron doors of my flat, I rather took fright at the terrible noise which would have alerted everyone up and down the staircase. I had to open the door, or they would have wrecked it. I rang friends, who came immediately to witness the unlawful goings-on. The investigating officer even went so far as to look in the toilet for extremist material. In the end they seized my computer. I filmed everything on a video camera because I was afraid they might plant drugs on me. The FSB man in charge even looked into the handbag of one of the witnesses. Fear was replaced by outrage at the high-handedness of the special forces. I was very distressed by their actions and couldn’t sleep for several nights. I had to get some counselling. Then I was sent to see the psychiatrists who were to examine me and give their opinion. There were 4 people in the room, all regarding me with complete indifference. The tone used by the man in charge was inquisitorial. It was perfectly clear that the examination was no more than a formality. They asked all sorts of questions, including why I had not done military service. I replied that I had refused to do it on principle. ‘So you’re a conchie!’ they squealed. I suggested they read the Constitution rather than making judgements about things they knew nothing about. They asked about my sexual orientation and I joked that I was a lesbian. One of the psychiatrists said with ill-concealed disgust ‘You probably consider yourself a dissident. We know about dissidents like you. We’ve seen plenty of them!’ I replied that it was psychiatrists like them that put sane people into mental hospitals and that they were the disgrace of Soviet punitive psychiatry. At the insistence of the FSB these psychiatrists concluded that I should be forcibly admitted to a psychiatric hospital to investigate how far developed my personality disorders were, though in-patient forensic psychiatric examinations are only carried out in the case of madmen, paedophiles and serial killers. We suspect that the plan was simply to inject me full of drugs in the hospital. The judge overseeing my case was well known for her perversions of justice, so it was no problem for her to follow the psychiatrists’ lead. Had it not been for the outcry in the federal media, the FSB would have taken me to the psychiatric hospital – they were waiting at the exit from the court. I realised that there was no point in relying on a law, which, in Karelia, would not work for me, so decided to go abroad. After I left Karelia, the investigators put me on the federal wanted list. When the investigating committee heard that I had asked for political asylum in Estonia, they wanted to put me on the international wanted list. Perhaps Russia will now start demanding my extradition. The Karelian Supreme Court threw out the decision of the city court and sent the case for further examination. At the new session, the investigating officer withdrew his call to have me forcibly hospitalised, but some time later went back to the court with the same request. It seems to me that it would quite a good idea to question the competence of the investigator himself ! This was the first case of punitive psychiatry in post-Soviet Karelia. Apparently the investigators and FSB officers regard the defence of human rights and criticism of the authorities as a serious deviation, for which treatment is necessary. It was alone the threat of imprisonment in a psychiatric hospital that compelled me to leave Russia and seek political asylum in democratic Estonia.